Hypocolius ampelinus Bonaparte, 1850. Single species in subfamily, taxonomy contoversial. Allied with thrushes, Turdidae (Lowe, 1947); throughout latter half of 1900s usually considered a subfamily within the waxwings. Sibley and Monroe (1990) and Clements (1991) suggest it might be closely related to bulbuls (Pycnonotidae), although affinities uncertain. English: Gray flycatcher; French: Hypocolius gris; German: Seidenwurger; Spanish: Hipocolino Gris. Crested, long-tailed birds with white on primaries. Male has black mask that encircles the head and black band on tail, in flight shows black primaries with prominent white tips. Female sandy-brown with creamy throat, lacks black mask, tail tip dark. Juvenile resembles female. 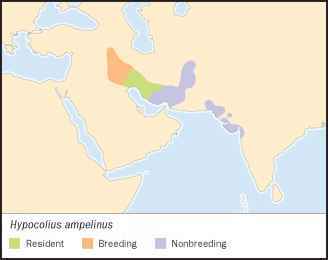 Breeding range centered in Iran and Iraq, east to Pakistan, winters in Saudi Arabia. Rare and irregular visitor to India. Semi-desert with scattered thorn scrub of berried bushes or around oases and date palm plantations. Gregarious, in winter seen in flocks up to 20 birds. Flight is strong and direct with rapid wing beats and occasional swooping glides. Raises ear coverts and nape-feathers when excited. Call a mellow, liquid tre-tur-tur, and whee-oo. Feeds mainly on berries, occasionally insects. Chiefly forages in trees and bushes, hopping about, occasionally descends to the ground to pick up insects. Lays three to six pale bluish gray eggs with black or brown speckles which may merge around the broader end of the egg to form a distinct ring. 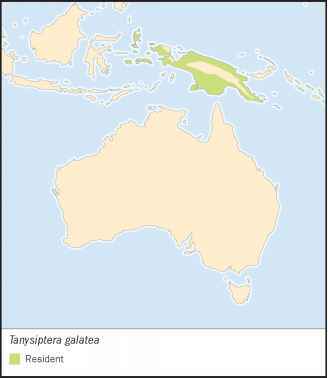 Status uncertain, but not currently a target of conservation efforts.